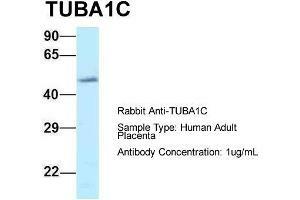 Characteristics This is a rabbit polyclonal antibody against TUBA1C. It was validated on Western Blot. Background Tubulin is the major constituent of microtubules. It binds two moles of GTP, one at an exchangeable site on the beta chain and one at a non-exchangeable site on the alpha-chain.